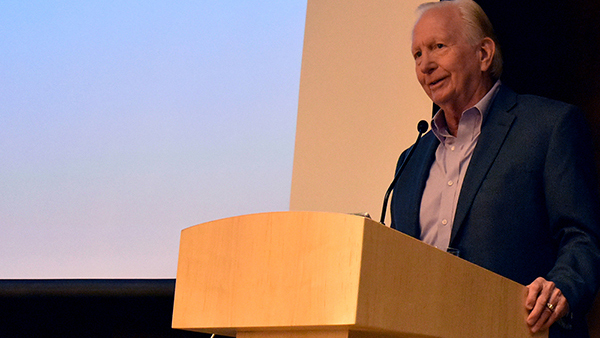 FSoS Professor Emeritus David Olson delivered the Cornerstone Symposium Lecture. Photo by Julie Michener. Would you compare your marriage or current romantic relationship to the I-35 bridge collapse? That was one of Dr. David Olson’s compelling questions during his Family Social Science Cornerstone Symposium Lecture April 5. Olson, a Family Social Science professor emeritus, used the metaphor to illustrate how PREPARE/ENRICH, a relationship assessment tool that he developed, can provide critical insights into the quality of a relationship and help couples be proactive in heading off issues that could turn into major challenges. In his illustration, Olson outlined some of the major facts that emerged in the investigation following the I-35 bridge collapse and how close they are related to what happens when a relationship begins to degrade. Olson used this sobering comparison because the statistics are sobering. The divorce rate in the United States still ranges from 40 to 50 percent of all marriages with an annual cost to society of over $110 billion. Not to mention the untold impacts on family health and well-being. These are numbers that Olson has dedicated his life to reducing. Bridging research, theory, and practice was not only the title of his Cornerstone address, it has been the theme of his career’s work defining and conducting research around his Circumplex Model of family systems. The native Minnesotan’s journey began with a bachelor’s degree in psychology from St. Olaf College, a master’s degree in psychology from Wichita State University and a Ph.D. in Family Relations and Child Development from Penn State. Olson said his experiences playing high school hockey illuminated his professional path to his early discoveries. Hockey helped him learn the value of diverse skills and understand the power and energy they can bring to a project. As co-director of a longitudinal study of early marriage and family development at the National Institutes of Mental Health, he observed that there was very little information sharing between different teams of mental health researchers. They were all playing within their narrow silos and each had their own vocabulary for describing what they were learning in their research studies – even though they were all drawing from the same case studies of families. When he began digging deeper into the work of the research teams as a whole, the dimensions that would form the conceptual foundation of the Circumplex Model of Marital and Family Systems began to emerge to him. Joining the U of M’s Department of Family Social Science in 1973, he continued his research into developing the three dimensions of the Circumplex model: cohesion, flexibility and communication. Olson hypothesized that couples and families exhibiting balance on cohesion (closeness) and flexibility (ability to adapt) will experience fewer relationship problems and communicate better, resulting in higher levels of satisfaction. Olson developed ten inventories/measures for research and clinical work with couples and families that assess satisfaction in a number of relationship categories and give participants insights into their relationship dynamic, commitment level, spiritual beliefs and personalities. Research around one of his assessments ­– PREPARE (Premarital Personal and Relationship Evaluation) – would disrupt the field of marriage and family therapy and draw widespread media attention. In the early 1980s, working with several of his doctoral students, Olson conducted a research study that demonstrated his premarital inventory could predict divorce with an accuracy rate of 80 to 86 percent. Olson’s findings were so radical that editors at the Journal of Marital and Family Therapy wouldn’t publish the results. They asked Olson to re-do the study ­– which he did – with similar results. JMFT published the report in its October 1986 issue. But even before the report was published, Olson’s compelling work was attracting the attention of colleagues and the media. He was invited to discuss his model at the 1985 International Congress on Families in Zurich, Switzerland, among others, and helped NBC Today Show Medical Expert Dr. Art Ulene create a 20-part series on family wellness in 1984. Following the JMFT’s release, the New York Times highlighted his PREPARE assessment’s predictive quality more than once in articles about relationships and marriage. Geraldo Rivera featured him on his daytime talk show and Oprah brought in an entire audience of premarital couples to devote a show to PREPARE’s efficacy. Olson himself has authored 20 books and contributed numerous chapters to colleague’s books as well as peer-reviewed articles and presentations. His relationship inventories – both for premarital and married couples – became so popular that Olson and his wife Karen founded a company (PREPARE/ENRICH) in 1980 to distribute them. Currently the relationship inventories have been translated into 12 languages and used by 2.5 million couples and families globally. Another measure, FACES (Family Adaptability and Cohesion Evaluation Scales) has been used in over 1,200 professional research studies. At the Cornerstone Symposium, Olson wasn’t resting on his considerable laurels. Even though he is stepping back from CEO duties as PREPARE/ENRICH transitions to its new parent company, Thrivent Financial, he was already looking forward to a new slate of initiatives that will be distributed digitally. The assessments will be available on the web and couples and families can assess their relationships on their own and access a variety of resources. Although he believes couples are best served using his inventories in concert with a trained professional, he has faith that even with a semi-structured online version, there will be benefits. Olson told the assembled audience that thinking and talking about their relationship is the most important thing a couple can do. They can identify their strengths and areas where they need to grow as well as improve their communication and conflict-resolution skills. He noted that balanced families have better health outcomes over the long term and that children have the strongest opportunity to grow up well-adjusted. Olson said he’s a believer in prevention because without regular maintenance and care ­– marriages and relationships – just like the I-35 Bridge – can experience catastrophic failure.